Surveillance captures a mother fighting off armed carjackers as her two children sit inside the vehicle in Hialeah, Florida on Monday, Jan. 19, 2016. HIALEAH, Florida -- Would-be carjackers picked the wrong mother to target as she fought off the armed-suspects barehanded. 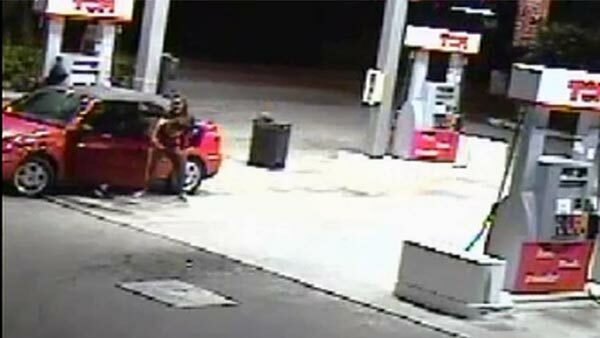 Surveillance video from the gas station in Hialeah, Fla. showed two women pumping gas, one at a minivan and the other at a convertible, shortly after 10 p.m. on Monday. Then suddenly, two masked-males armed with guns ran up to the women with their firearms drawn. The armed-suspects appeared to approach the minivan first, but the driver quickly jumped in the vehicle and locked the doors. The suspects then hit the windows with their guns and told the woman to open the doors, but she drove off. The two males then turned their attention to the convertible at the next gas pump over, as one suspect attempted to get in the driver's seat. Inside the vehicle was the driver's 1-year-old daughter and 7-year-old son. Fearing her children would be abducted, the mother sprang into action, quickly grabbing the suspect in the driver seat, pulling his mask off and throwing him from the vehicle. The two suspects then ran away and police said they jumped into a getaway vehicle to flee the scene. Following a quick pursuit that ended in a crash, officials said the getaway vehicle was searched and three hand guns were confiscated. Police said 19-year-old Nicholas Rosado, 21-year-old Rebecca Utria and a 17-year-old male were arrested for attempted carjacking, fleeing and eluding the police. Utria served as the getaway driver as Rosado and the teen attempted to carjack the vehicles, according to officials. Police said there were no reported injuries during the attempted carjackings or the car crash.